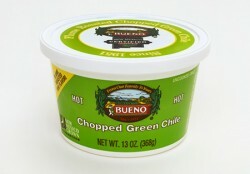 Bueno Foods is the first company to become NM Chile Certified! This means that when you see the Certified logo, you can be certain that you are getting 100% New Mexico grown Green Chile. New Mexico Certified Chile™ is independently audited and certified by the New Mexico Chile Association. Ask your retailer or your favorite restaurant if they offer Certified Chile, guaranteed to be grown in New Mexico. If it’s not Certified, it may not be from New Mexico. Did you know that New Mexico’s chile crop is in peril? New Mexico’s chile acreage is down by 75% compared to 1992 when it was at its peak. Learn more how you can help save New Mexico’s chile. Help keep the New Mexico chile tradition growing by asking restaurants if they are using New Mexico grown chile in their recipes. Look for the New Mexico Certified symbols on packaging and in restaurants that guarantee New Mexico grown chile. The fertile Hatch and Rio Grande River Valleys in New Mexico grow the best green chile in the world. For generations, chile has been the pride and joy of New Mexican culture and tradition, the heart and soul of local cuisine. But, did you know New Mexico’s favorite crop is in peril? New Mexico’s chile farmers and producers are in trouble. And you and I may be too. Imagine New Mexico without our chile—that’s like New Mexico without its sunshine! Today 82% of chile consumed in the U.S.A is foreign grown (from Mexico, Peru, China and India). While U.S. chile consumption is skyrocketing, New Mexico’s production is in steep decline. Just five years ago, New Mexico’s chile industry, made up of long term, family-owned farms and small family-owned businesses, provided 5000 full-time jobs and 10,000 part-time jobs to New Mexicans. Those numbers have dropped almost in half. Help Keep New Mexico Green! As native New Mexicans from a long-time New Mexican family, our mission at Bueno Foods has always been to preserve our New Mexican heritage through the authentic food we provide to our customers. When the possibility of losing our cherished crop came to our attention, we had to act. Chile is our collective cultural heritage as New Mexicans. Without it, we’d lose our identity, our very soul. As we talked with people around the community, we realized so few knew about the situation–the peril our state’s crop was in. So, we started this Keep New Mexico Green Awareness Campaign. We ask for your support . . . to Keep New Mexico Green! Many New Mexicans think if they buy their chile in New Mexico, it’s from New Mexico. They think if they buy from New Mexico companies, their chile is automatically guaranteed to be from New Mexico. They think if they eat at their favorite New Mexican restaurants, the chile they eat there is grown in New Mexico. Not necessarily true! You’d be surprised at how many companies and restaurants buy Mexican chile or chile from other countries because it’s cheaper (cheaper labor, less or no regulation.) NAFTA made this possible because there were no protections for the New Mexico chile industry. At Bueno Foods, we take great pride in the fact that our chile is grown in New Mexico by New Mexico farmers. Obviously, we hope you buy BUENO®. But our greater hope is that you buy New Mexico grown chile and help reverse this trend. Be informed. Let’s not allow the state’s question to become: “What country does your chile come from?” Help save New Mexico chile! Ask restaurants if they are using New Mexico grown chile in their recipes. Ask how you, as a customer, can be sure. If they are not using it now, insist they do—if they want your business. Look for symbols on packaging and in restaurants that guarantee that the chile sold, or the chile used in that establishment, is grown in New Mexico. Be sure. Trust but verify. Insist on New Mexico grown. Keep our New Mexican cultural heritage alive!